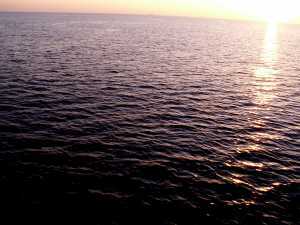 ----Winters get long and dark for a cruising boater. Often we are seeking warm and sun along the Gulf coast, but the winter of '07 we were 'grounded', by necessity, due to some long overdue preventative maintenance tests for the admiral and skipper (there sure are a lot of medical scans necessary to assure that all systems are go). -----We anticipated being ashore for winter 'break,' last summer, while trailering Halcyon across the Cascades to explore some northern Idaho lakes, But had not explored ideas for activities during those months. Our mail is forwarded from Nevada (our ol' home state) and this time, last summer, it was sent to our Washington friends Pat and Patty, with whom we were going to explore Idaho lakes. We met while driving over the mountains and they delivered our mail. 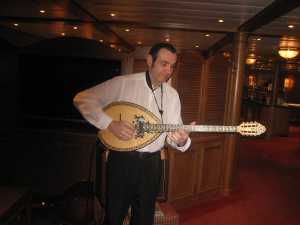 -----"Greece," El said as she opened mail from our packet. Then, more emphatically, "GREECE." -----I gripped the steering wheel, searching the road ahead for the threatening slimy streaks of grease that could slide us and the boat into the ditch. -----"Where?" I said through clenched teeth. -----"Oh, you know! Southern Europe! 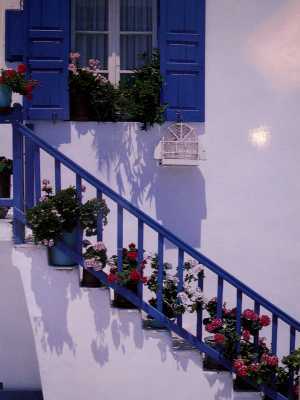 Greece!" 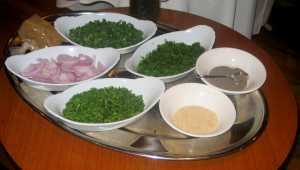 -----Homophones!!! One of the most confusing aspects of spoken language. Remember, as a kid, not understanding the folks when they said, "You ate eight candies!" or "We do not see the dew, due to the shade." Erg! 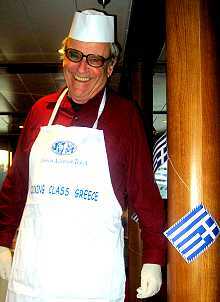 -----"Oh" says I, relaxing my grip on the wheel, "that Greece." -----"Let's call them and see if they want to come with us." -----El is usually way ahead of me, and this time, looking at my blank face, she could see that I had disappeared somewhere way back in her wake. 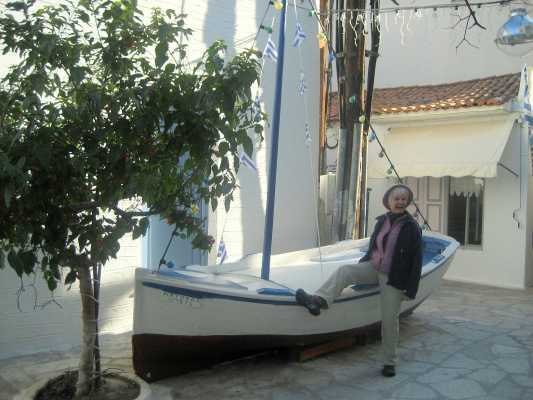 -----"We just got a flyer about a small-boat cruise along the Peloponnese next February," she patiently explained as though she was translating a foreign language (and to me, thinking of the road ahead or, at most, splashing into an Idaho lake, she was). -----She called Patty. That, by itself, is still mind-blowing to me (or anyone else over thirty, and we're more than double that 'magic' thirty years connoting old age). "Talk" to someone in an accompanying car? Slowly letting the convenience of cell phone telecommunication dawn on my driving brain, I again hit a mental brick wall -- what about the expense of that call? Our Arizona phone number calling Patty's Washington number while driving through Idaho ? Sorry, youngsters, us ol' timers grew up instinctively shying away from any "long-distance" call. The cost would mean no stopping for a lunch at the café today. I finally moved into the 21st century and got on El's wavelength as well. -----El made the 'free' call to Patty. 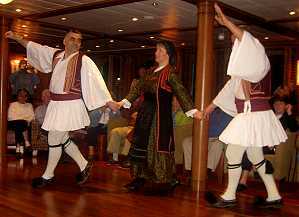 "Hey, we just got an interesting brochure about a small boat cruise in Greece in February. Wanna come with us?" -----"Huh?" Obviously, Patty was also not in the frame of thinking about either February or Europe during her midsummer drive in Idaho. -----I've been with El the better part of fifty years and still have never become accustomed to how quickly she can grasp a new thought - or challenge - or plan of action. Impulsive? Well, not really. That implies lack of caution or contemplation. She covers all the plusses and minuses, the rest of us ponder for days, in a nanosecond and comes to a rational choice -- while I'm still trying to visualize Greece. -----At the next rest stop we gave the brochure to Pat and Patty for them to discuss and consider. Meanwhile, El had already called her travel consultant (we belong to an Overseas Adventure Travel Club, and they know El) and signed us up. 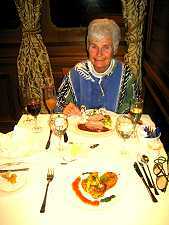 ----We don't like group travel, being independent folks, who, like cats, don't want to be herded. Our earlier trip to Greece was just the two of us and several months of hopping randomly on and off Greek ferries through the Aegean Islands and Cyclades. One stop was in Crete, for an intended overnight ferry connection. 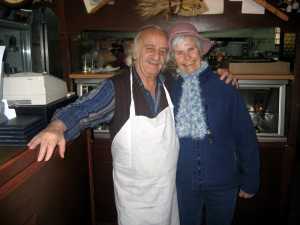 We loved the town and stayed three weeks - local shopkeepers filled our need before we had cleared their front doors, new friends invited us to their homes for dinner and dancing, and the local radio station interviewed us to get a "local American's" viewpoint on some current event in the US. No, we're not ones for group tours. However, either because there are some parts of the world where travel is a nightmare (for any number of reasons) or where the means of travel (like a small boat) are hard to arrange we will travel with a small group due to our perceived necessity. 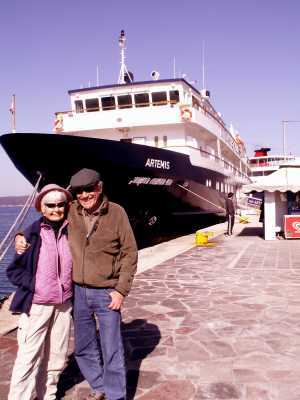 -----So, from a summer decision along a highway in northern Idaho, to Piraeus, Greece, we were now aboard the M/V Artemis, a 193-foot vessel whose width is greater than our Halcyon's length. She belongs to Overseas Adventure Travel, the small-group travel company we have been with for guided trips to the Balkans, Zimbabwe, India and other interesting places. 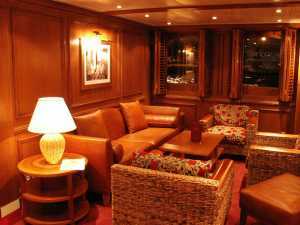 -----The ship is comfortable and the accommodations commodious, the food delicious prepared by a marvelous German chef, and the crew excellent, both competent and with ready smiles. The small ship allowed all-the-time access to the bridge, an advantage (as boaters) we enjoyed. 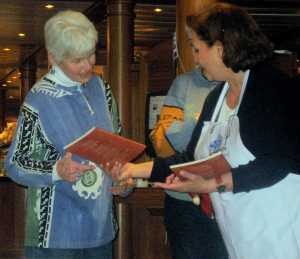 -----On board, in the evenings, the OAT staff had arranged some great activities, both educational and purely for entertainment. The cooking class was especially interesting to El and I who have been taking regular cooking classes in our winter home of Colorado. -----Or is it the blood-red sea? We passed over the site of the 'Greatest Battle of the Ancient World' - the Battle of Salamis -- a naval fight between the Greeks and the Persians in 480 BC. 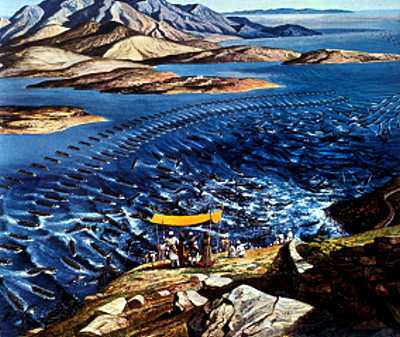 A massive fleet of 1,207 Persian ships faced only 371 Greek trimenes. The Greek leaders quarreled over the best tactics, since their army had been destroyed ashore. The Spartans wanted to build a wall across the peninsula leading to the Peloponnese but the Athenian Themistocles thought that would be fruitless, since the Persian navy could transport their army by ship around the wall. 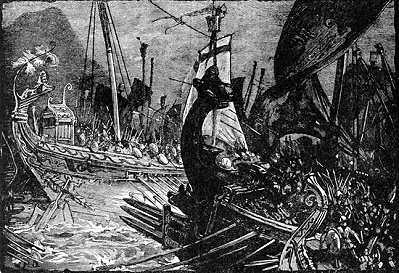 There were about 200,000 Persians aboard the fleet and the Greeks had only a fraction as many. Xerxes I, the Persian leader was so confident of victory that he set up a throne on the shore overlooking the straits so he could have a commanding view of the slaughter of the Greeks. The Greeks sent a 'pretend' deserter to report to the Persians that the Greek fleet intended to sneak away under the cover of darkness. 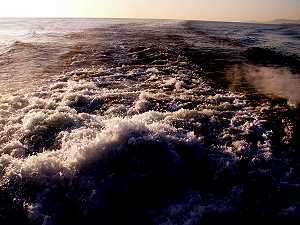 The Persians, believing the report, spent the night searching the straits while the Greeks slumbered on their vessels. -----The Greek triremes attacked at dawn, and then, realizing they had an advantage in the narrower passages, they retreated to the narrows. They also wished to take advantage of the morning winds, which were just starting to blow. The Persians ships 'broke ranks' when they saw the retreating (and they thought defeated) triremes, and this was exactly what the Greeks wanted. They quickly turned their nimble triremes, and attacked the scattered Persian fleet. 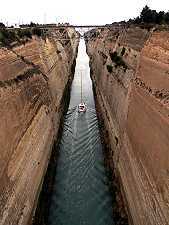 Only a few Persian vessels could navigate the narrows at a time, and the more nimble Greek ships could destroy them. The larger Persian ships also rocked heavily in the wind, and their soldiers primarily armed with bows and arrows, were unable to maintain accuracy. The Greek warriors fought hand to hand, and soon were slaughtering the archers. The Greek triremes were also armed with an embolon, a sharp bronze protrusion along the water line from the bow, and soon they were impaling and sinking Persian ships. -----The Greeks were able to encircle the Persian fleet, and killed the Persian naval leader - disrupting the Persian command and creating confusion. Most Persians could not swim, and thousands drowned. Persian bodies washed ashore for weeks and even months after the battle. 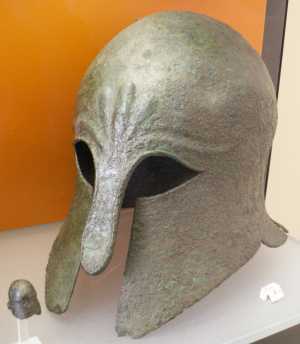 Those that managed to reach shore were slaughtered when found by Greek warriors. -----Some historians contend that this was the most important battle ever fought in human history. Had the Persians won, Europe would have been dominated by the Persians and Western Civilization would have been terminated, along with the concepts of individual rights, democracy, and western art, philosophy, science, and architecture. 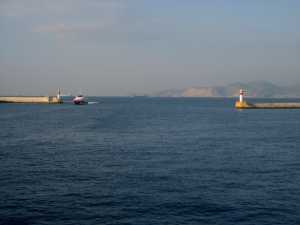 -----A great advantage of this trip, and why it instantly appealed to El, is the access to Greek Islands otherwise available only through ferries. 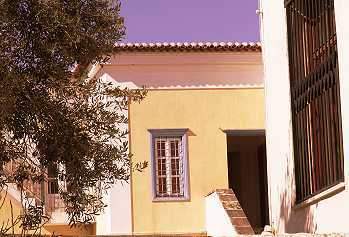 This trip made access quick and accommodations easy (right on the ship) as we visited some of the islands of the Saronic Gulf. 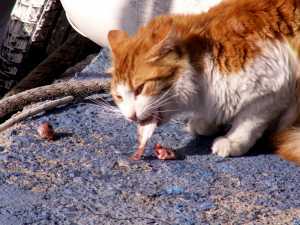 -----Why Saronic? 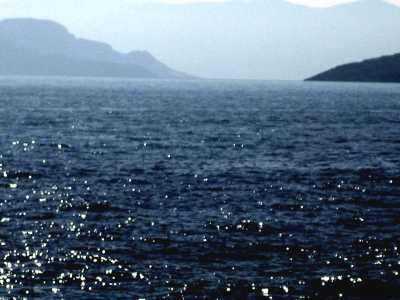 Mythical King Saron of Argos drowned in this gulf while pursuing a deer, that had swum out to the gulf. hard way to get a geographic location named for you, eh? 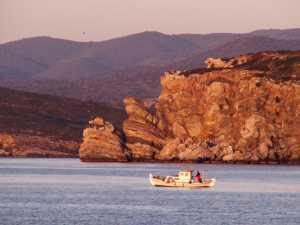 -----These islands are scattered like pebbles off the northeastern coast of the Peloponnese Peninsula, just to the southwest of Athens. Many of the islands are green, with a scattering of white or pastel-shaded houses under red tile roofs. They do not have the most outstanding beaches, architecture or widely-recognized ancient ruins so are not as heavily visited by tourists, thus preserving much of the indigenous nature of the residents. 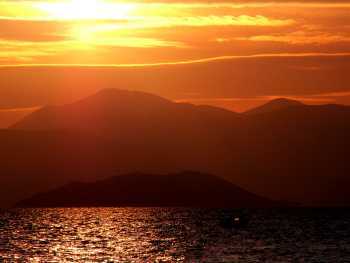 -----This is the most distant Saronic Gulf Island from Athens. It has heavily forested hills of Aleppo pines, planted by a Greek who emigrated to America and became wealthy and then returned to cover the barren hills of his home island with greenery. 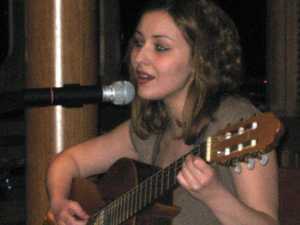 -----El discovered Bouboulina, who is legendary on Spestes. She was born in an Ottoman Prison, where her father died. Eventually freed, she returned to Spestes but only a short time later her husband died fighting Algerian pirates. 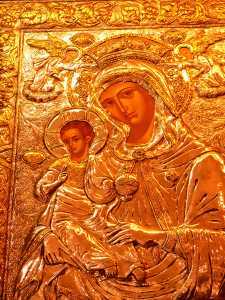 She inherited his shipping business and fortune, and built a large warship, Agamemmnon, and other smaller military vessels. She joined a revolutionary group (its only female member) in revolt against the Ottoman Turks, then in control of most of Greece. Using her fleet of ships, she brought arms and ammunition to Spestes to arm her warships. 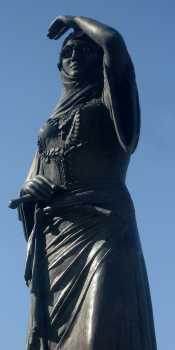 In 1820, in conjunction with other rebel Greek ships, she fought the Turks. Ironically, her daughter married the son of the Turkish commander and later, when the Turkish garrison fell, Bouboulina saved the lives of most of the women in the sultan's family. 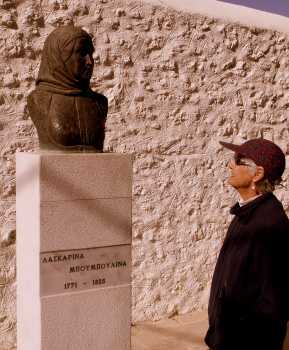 -----After Greek Independence, she was arrested during the Greek Civil War and her son-in-law killed by the government. She was exiled to Spestes. There her son eloped with the daughter of a prominent family. Enraged, the girl's father and armed members of the family came to Bouboulina's house. She confronted them on the balcony and was shot in the chest and died. 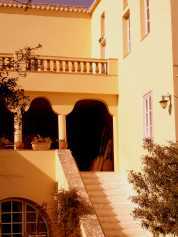 -----This island is famous for its villas, its artists, and the movies that have been filmed here. Motor vehicles and bicycles are prohibited on the island. 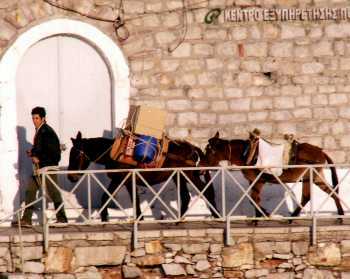 Consequently it is known for its donkeys, mules and hikers. 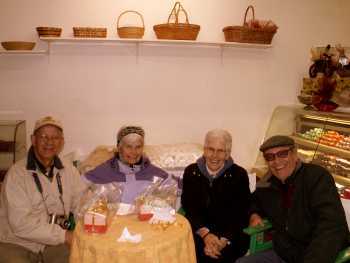 We found a delightful sweet shop, up a side street at night, to share with our new friends George and Jane. 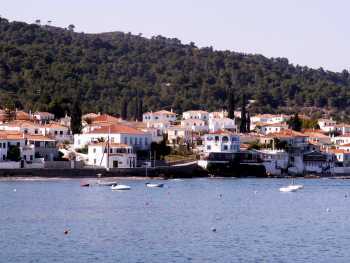 -----Poros was in ancient time the island of Poseidon, the god of the sea. There are literary references to this home of Poseidon and traces of a temple, built in 520 BC in homage of Poseidon, in the interior of the island. 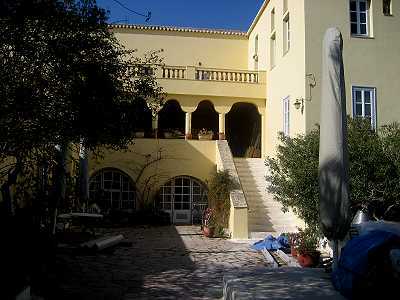 ------This is the closest Saronic Gulf Island to Athens, and many Athenians have second homes here. 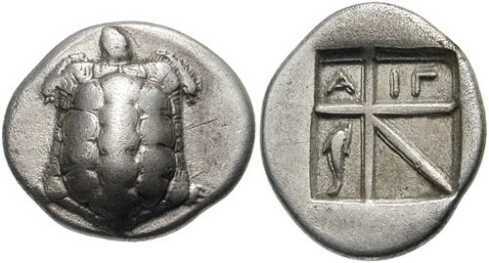 Only 30 or 40 years after the invention of coinage by the Lydians (who lived in part of present-day Turkey, about 700 BC), Aegina became the first state of European Greece to coin money. Thus it was the Aeginetes who introduced coinage to the western world. ------The Temple of Apollo, also known as "Kolona" (meaning column) is one of the first sights that we saw as we entered the port of Aegina. This was the site of an ancient naval base, from about 3,000 BC. 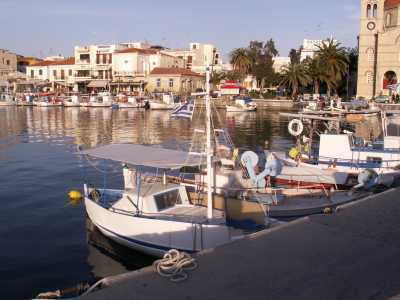 The Aegina navy played an important role in the history of the island. 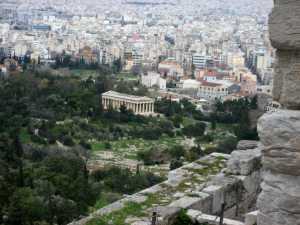 ------The Temple of Aphea Athina is one of the best preserved ancient temples found in Greece. 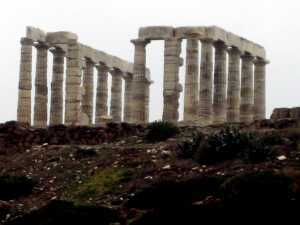 It was built to form a "sacred triangle" between the temples of the Parthenon in Athens and the Poseidon Temple at Cape Sounion (pictured in the section, The Sea, on this site). These temples were built in the early 5th century BC. This is perhaps our favorite Greek artifact from antiquity - it is stunning. ------We arrived back at the harbor near sunset, after a marvelous day exploring the interior treasures of ancient Greek history - some of the most important roots of our culture. 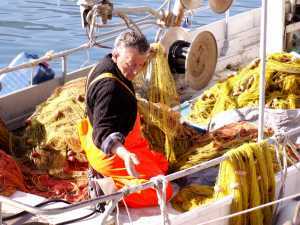 ------The sea was fussing, with some winds up to force 5 and waves that restricted travel even to our almost 200-foot long vessel. 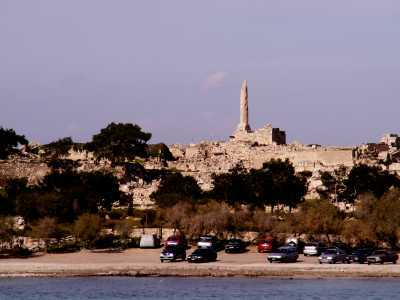 So, on those days harbor-bound in Piraeus, we took minibus trips to mainland archeological sites. 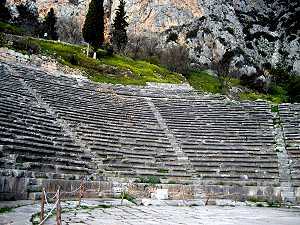 One of those trips took us to a site we had long hoped to visit - Delphi. This location was one of the most significant in ancient history, and is a fascinating unfolding geological tale. ------High on the slopes of Mount Parnassus, a herdsman, sometime before 1200 BC, noticed his goats acting strangely as they grazed near a fissure on the mountainside. Approaching the fracture, he breathed in the fumes and entered a prophetic state. A good place for a temple, the locals decided, and originally built a shrine to Gaea, the earth goddess. 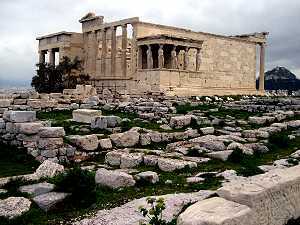 About the eighth century BC the temple was dedicated to Apollo, the god of prophecy. Here, cradled in a spectacular mountainscape at Delphi, this temple became the most important religious site of the ancient Greek world. They considered it the center of the world and marked the site with a large conical stone. ------Now, instead of a wandering herdsman, priests and a priestess became the prophets - a powerful oracle. Generals sought the oracle's advice on when the empire should go to war, and on the strategy to use during the conflict. Colonists asked for guidance before they set sail for Italy, Spain and Africa. 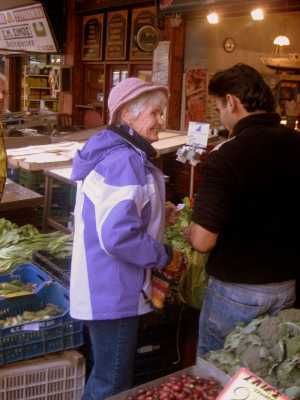 Private citizens inquired about when to plant their crops, health problems and investments. 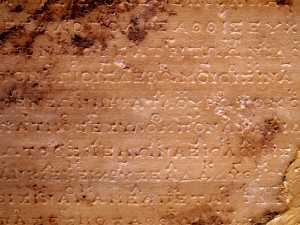 The oracle's advice occupies a prominent place in the myths of ancient Greece. Oedipus, warned by the oracle that he would murder his father and marry his mother, strove, with famous lack of success, to avoid his fate. Another oft-repeated pronouncement named Socrates the wisest of men. ------The oracle spoke through the Pythia to have the future foretold. 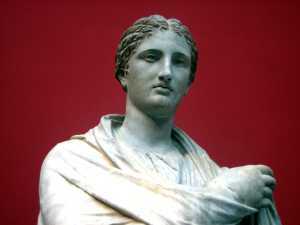 The Pythia were the medium through which the god Apollo spoke, and the role of Pythia was filled by a woman. These women were the 'psychics' of their day, from about 1400 BC to 381 CE. 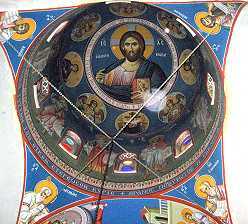 ------There was a traditional legend, originating from the Greek author Plutarch who was a priest at the Temple of Apollo in the first century AD. Plutarch described how the Pythia would enter a small chamber in the basement of the temple of Apollo and inhale sweet-smelling vapors ("pneuma") from that fissure in the mountain and then enter a trance. In her narcotic state, she would give answers to the questions presented to her by the intermediary of a priest. The priest then interpreted her pronouncements for the questioners. Other ancient texts also tell of the mysterious vapors at the temple site causing a trance state to the priestess. 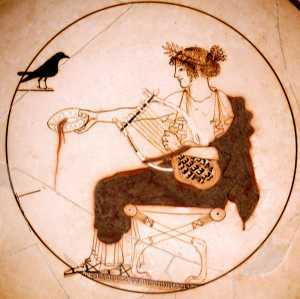 A contemporary painting on pottery has been interpreted to show the vapors being inhaled by the Pythia. ----Eventually, as Christianity supplanted ancient tradition and beliefs, the power of the oracle waned. Legend states that the concentration of the gases also waned during this time (perhaps due to a long time-gap in the activity of earthquakes, which fractured the rocks and released the gases). ------In 1927 French geologists investigated the claim of vapors at Delphi and found no evidence of the fracture or rising gases, and dismissed the "pneuma" as myth. They, however, were of an era when geological science attributed vapors escaping from cracks in the earth only to volcanic activity and the geology of Delphi is not volcanic. This view was repeated by a French archeologist in 1950. ------The Greek government hired an American geologist, Dr. de Boer, from Wesleyan University in Connecticut, in 1981,to study the geology around Delphi to determine if the area would be suitable for the construction of a nuclear power plant. One of the most important aspects of this study was to find the location of fault zones and determine if they had recent activity. ------The following is a real-life detective story, underlining the excitement of doing scientific research. The information is from Nature.com (2001); Geology, 28, 651 - 654, (2001); and Geology, 29, 707 - 710, (2001). ------"'A lucky thing happened," de Boer called. Heavy tour traffic had prompted the government to carve in the hills east of Delphi a wide spot in the road where buses could turn around, exposing a "beautiful fault," he said. "It looked young and active." ------On foot, Dr. de Boer traced it for days, moving east to west over miles of mountainous terrain, around the indigenous thorny bushes. The fault was plainly visible, with as much as 30 feet of offset. 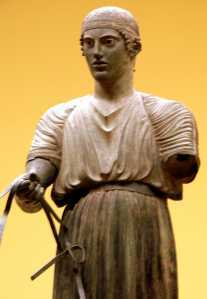 West of Delphi, he found that it linked up to another known fault. 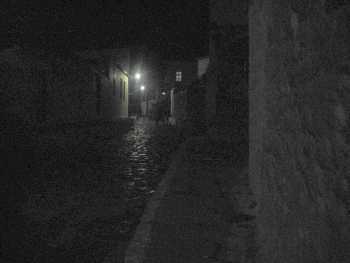 However, In the middle, right near the oracle's Temple, it was hidden by rocky debris. But, the fault appeared to run right under the temple. 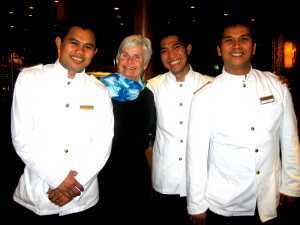 ------"I had read Plutarch and the Greek stories," Dr. de Boer recalled. "And I started thinking, "Hey, this could have been the fracture along which these fumes rose". Dr. de Boer put the idea aside. Knowing little of the archaeological literature, he assumed that someone else must have made the same observation years earlier and come to the same conclusion. ------In 1995, he discovered his mistake. While visiting a Roman ruin in Portugal, he met Dr. John R. Hale, an archaeologist from the University of Louisville, who was studying the Portuguese site. At sunset, the two men shared a bottle of wine, and the geologist began telling the archaeologist his discoveries at Delphi. ------Dr. Hale recalls saying, "There is no evidence to those gas theories, and the relationship to faults," citing the conclusions of the French team. But Dr. de Boer convinced him otherwise. 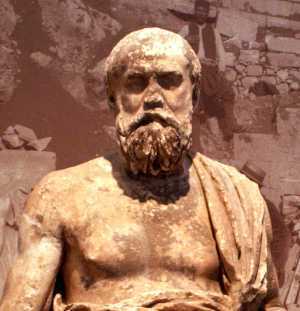 He cited both Plutarch, a Greek philosopher who served as a priest at Delphi, and Strabo, an ancient geographer. Each told of geologic fumes that inspired divine frenzies, with Plutarch noting that the gases had a sweet smell. And he discussed the fault evidence he had mapped at the site. By the end of the evening, the geologist and archaeologist had decided to work together to find the truth. ------Back in the United States, Dr. Hale tracked down the original French reports on the temple excavation and discovered, to his surprise, notations that the bedrock on which the temple was built was "fissured by the action of the waters." The French archaeologists, expecting a yawning chasm, had apparently overlooked the importance of the small cracks. "What I had been taught was wrong," Dr. Hale recalled. "The French had not ruled it out." ------By 1996, the two men had traveled to Greece to resurvey the fault at Delphi and study the geological maps compiled by Greek geologists. 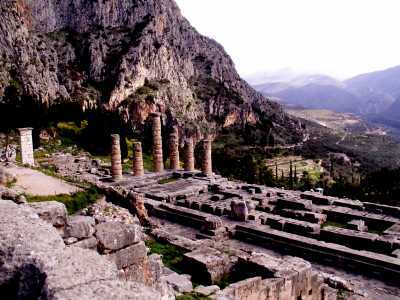 These revealed that the underlying strata at Delphi were bituminous limestone containing up to 20 percent blackish oils. "I remember him throwing the map at me," Dr. Hale said of Dr. de Boer. "It's petrochemicals! No volcanism was needed, contrary to the previous speculation. 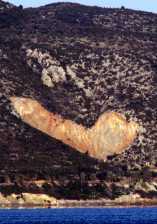 Simple geologic action", Dr. de Boer insisted, "could heat the bitumen, releasing chemicals into temple ground waters". ------During a field trip in 1998, the vent notion grew more plausible still as the two men discovered a second fault, which they named Kerna after a well-known spring, going north- south under the temple. The intersecting faults now marked a provocative X. ------As intriguing, the second fault appeared to be aligned with a series of ancient dry springs, one directly beneath the temple. The scientists found that the some springs were now dry, and they were coated with travertine. This precipitate gave a rocky clue suggesting that the waters had come from deep below. When hot water seeps through limestone, it leaches out calcium carbonate that stays in solution until it rises to the surface and cools quickly. 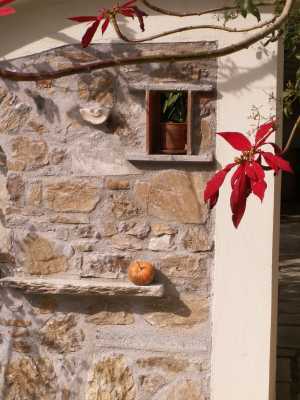 The calcium carbonate can then precipitate to form the rocky layers of travertine. 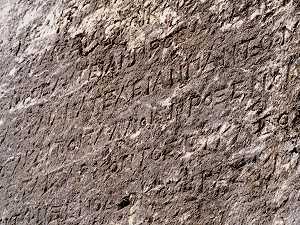 ------Increasingly excited, the two men won permission from the Greek authorities to sample the travertine. At this point, Dr. Jeffrey P. Chanton, a geochemist at Florida State University, joined the team. He analyzed the travertine samples gathered from dry springs near the temple and in its foundation, finding methane and ethane within the travertine. Each gas can produce altered mental states. But a better candidate soon arose. 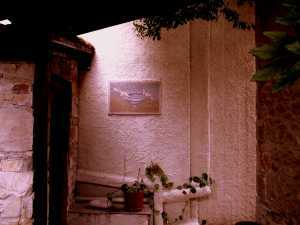 ------"A small light went off in my mind," Dr. de Boer recalled. Perhaps, he speculated, ethylene had been there as well. Ethylene is significantly less stable than ethane and methane, so its absence in old rocks was understandable. Yet psychoactively, ethylene is quite potent, more so than ethane, methane or even nitrous oxide. From the 1930's to the 1970's, it was used for general anesthesia. 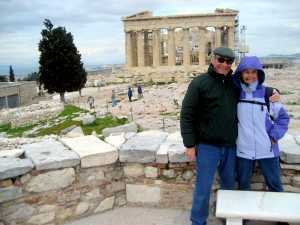 Dr. Chanton went to Greece, sampling an active spring near the temple. ------The team waited. Days passed. Then his call came in. He had found ethylene, as well as methane and ethane. To all appearances, the ancient riddle had been solved. ------In late 2000, Dr. Henry A. Spiller, the toxicologist who directs the Kentucky Regional Poison Center, joined the team to help with the pharmacological analysis. "There's a fair amount of data on the effects of ethylene," Dr. Spiller said. "In the first stages, it produces disembodied euphoria, an altered mental status and a pleasant sensation. It's what street people would call getting high. The greater the dose, the deeper you go. Once a person stops breathing ethylene", he added, "the effects wear off quickly".-Modern teenagers know of such intoxicants, including ones that in overdoses can kill. Experts say that youths who breathe fumes from gas, glue, paint thinner and other petrochemicals are toying with these hydrocarbon gases. 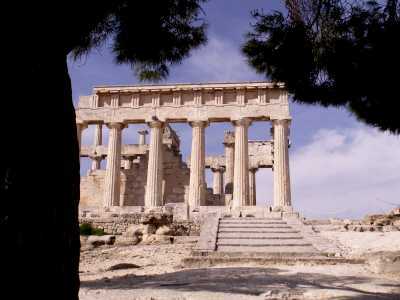 ------Of late, Dr. Hale has been widening his focus, investigating other ancient Greek temples that he believes were built intentionally on geologically active sites. Dr. de Boer is still concentrating on Delphi. Recently, he and some students left for Greece to drill out rocky samples from the fault zones and illuminate them under a special light to try to establish dates of seismic activity.-Such geologic shocks, he said, may have influenced fume production over the ages, causing the intoxicating gases to wax and wane. ------"You never know if it will work," he said of any research project shortly before the Delphi trip. "With the fumes, it did. With this, we don't know. But it's worth a try." ------That's the essence of scientific research - you come up with an idea, state it as an hypothesis, and then test it - give it a try. If the results substantiate the hypothesis, many others also give it a try, and if the results replicate the hypothesis, it is then elevated to fact and, if widely significant, stated as a theory. Doing science is solving a mystery story -- a riddle - left by nature. -----This section is currently being written. 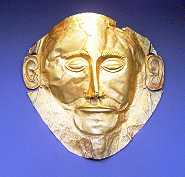 -----Another example among the ancient Greeks is the belief in Poseidon as the god of the sea and earthquakes. According to Harris-Cline, modern science associates the two with tectonic movement deep under the sea. -----One of my first memories as a child was 'working' in my Dad's lab at his University. We'd walk together, up a long winding trail, shaded by chestnut trees, watching the scurrying squirrels, while en route to the big gray stone building at the top of the hill where Dad had his office and lab. In the lab, with all its strange but wondrous smells (to a little tyke, anyway), he would sit me on a tall stool at the marble counter that ran the length of his wood-panneled room. There he would assemble a dozen vials of brightly-colored liquid. He worked at the end of the counter, with his brightly-colored cultures (he was developing an antibiotic to counter the growth of the yellow fuzz that was the fungus of athlete's foot, I learned years later). My job was to mix my colored liquids any way I wished -- my I produced some (to a three-year old's eye) dazzling concoctions. Of course, much later Dad confessed to me that he was 'babysitting' and keeping me amuzed with water tainted with food colors. But at the time, I was a scientist and perhaps my joy at 'doing science' at that tender age helped guide me toward science as a career. 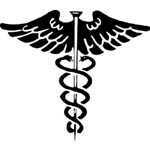 -----I asked him about the strange symbol, and he replied that it was a cadeusus, the symbol of medicine in America. Since that first sighting, I have seen this symbol in hospitals, medical buildings and often in telephone directories for doctors or other references to the medical profession. 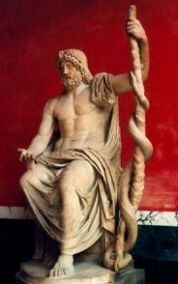 In Greek mythology, Asclepius was the god of medicine and healing. -----He was often shown holding a physician's staff with a single snake wrapped around the rod.-It's origin is lost in torn out pages of history. However, some think their is a snake wrapped around the rod of Asdlepius because of a common belief that a snake, shedding its skin, was demonstrating rebirth and fertility. Others in ancient time believed that a person left overnight with a snake would be magically healed. -----So how did the single snake of the Greek god of medicine become the two snakes of the cadeusus, the symbol in America and much of the world for things related to medicine? -Early confusion between the symbols almost certainly arose due to the links between alchemy and Hermes, whose symbol is the caduceus. The alchemists adopted the caduceus because Hermes, the God of Messengers, was the patron lord of commerce, travel, theft and alchemy. There was often confusion between the fields of alchemy and medicine. -----The main reason for the modern confusion over the symbols, in America, occurred when the caduceus was adopted by the Medical Department of the United States Army in 1902. This was brought about by one Captain Reynolds, who after having the idea rejected several times by the Surgeon General, persuaded the new incumbent (W.H. Forwood) to adopt it. The inconsistency was noticed several years later by the librarian to the surgeon general, but was not changed. 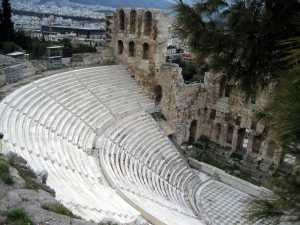 -----Asclepius, the healer and son of Apollo, was thought by the ancients to have been born in Epidaurus. 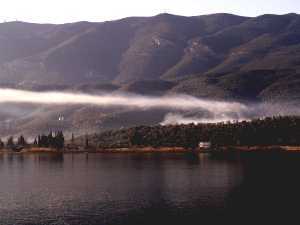 The early Greek cult of Asclepius constructed a hill-top healing center at Epidaurus. 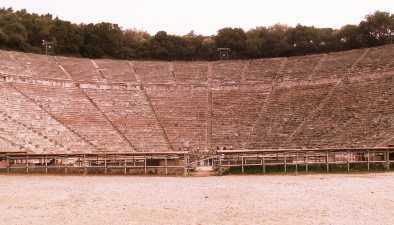 The asclepieion at Epidaurus was the most celebrated healing center of the Classical world, the place where ill people went in the hope of being cured. To find out the right cure for their ailments, they spent a night in the enkoimitiria, a big sleeping hall. In their dreams, the god himself would advise them what they had to do to regain their health. 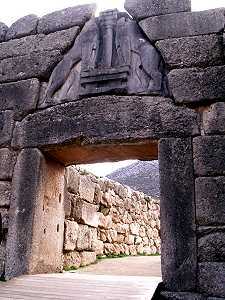 A guest house, with 160 rooms for those being cured, was built at the site in the 6th century BC. A theater was constructed at the same time to entertain those who were undergoing cures at the santuary. There are also mineral springs in the vicinity which may have been used in healing..
Delphi - Early Greek Writing - "Know Thyself" "Nothing in Excess"